Greetings. I hope this note finds you well and enjoying the early spring weather. This month I have chosen some new works by some of my favorite artists. I hope you enjoy seeing them and look forward to any comments or questions you might have. This piece is from Lino’s well-known Bilbao series. It is an excellent example of Lino’s mastery of several of his favorite techniques. 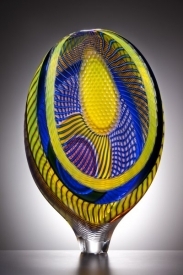 These include the intricate cane work, the multiple layers of color and several types of surface cutting. 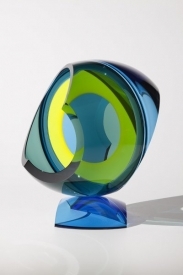 In addition to being a virtuoso piece of glass sculpture, it is simply a magnificent piece of art! 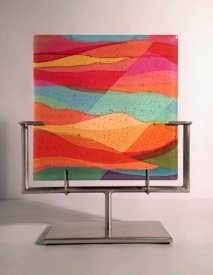 11 1/8" x 9 3/4" x 3 1/2"
Many of you are quite familiar with the glass panels by Dorothy Hafner. Recently Dorothy has been creating a new series called "Miniatures." These panels are only 8" x 8." The designs, however, are as colorful and intricate as her larger pieces. The two I am featuring here are among my favorites and you can see more here. This new sculpture by Seattle artist John Kiley is striking in many ways. Sculpturally it is compact and yet lyrical. The addition of the base creates a "breathing space" around the sculpture which is quite effective. It also allow for a little more light to pass through the piece. In addition, I love this particular color combination. This cube by Jon Kuhn was literally finished yesterday and photographed today. Its title, "Amazing," says it all. 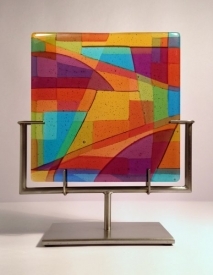 The color combination, the beveled edges, the intricate color core both in the center of the piece and at its base, all combine to make this a truly stunning piece of glass art. I hope you have enjoyed this month’s edition of Holsten Galleries news and I look forward to staying in touch.